This post originally appeared on the old site on March 31, 2005. Recently there's been a lot of negativity in the IndieGamer Forums. This is nothing new, but a lot of incorrect ideas are being thrown around. These ideas include statements such as "You have to be on the portals to be successful" and that "It was easier to be successful in the 90s". These are simply not true. At this point I like to point the n00bs at Dexterity's Brainwave as a counter-example. Brainwave has been ludicrously successful by our standards. It's $9.95, utter utter utter crap, and Steve P. reckoned once in a post that it had made him $10k-$12k over the years versus the 2 weeks he put into developing it. I've never seen the game and I suspect it was not crap (especially for its time), but this gave me an idea. Everybody keeps focusing on the big hits like Bejeweled as examples of successful indie games. But how about looking in detail at a smaller game, a small success, a game that made money and shows how you can make money with small, simple games. Therefore, I'll tell the story of my game FreeCell Plus. FreeCell Plus is one of my first products, released in 1996. It is one of my lowest selling games (now), but by comparison to some of the sales reports on Indiegamer, it was a huge success. It certainly is a very profitable game. Here I will tell you how FreeCell Plus came about, how it was developed, where it stands today, and how it shows that a small game with a targeted focus can be successful. It is December 1995. Windows 95 was just released a few months earlier in August. Bundled in Windows 95 was a new game in addition to the solitaire game that came with previous versions of Windows. Windows 95 came with a game called FreeCell. In these last few months of 1995 many people were seeing FreeCell for the first time on new computers with Windows 95. But everybody didn't move to Windows 95 at once. In December 1995, most people were still using Windows 3.1. They saw Windows 95 on new machines, at work for example, but then came home to Windows 3.1. Windows 3.1 did not include FreeCell. 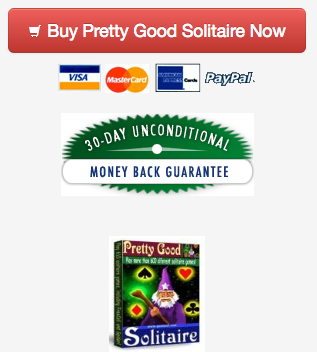 My Pretty Good Solitaire game had been on the market for awhile longer than Windows 95. It worked on Windows 3.1 and included FreeCell. A lot of people were finding it and buying it because it was a way that they could play FreeCell on Windows 3.1. However, I started getting emails from people who wanted to play FreeCell and only FreeCell. They weren't interested in all the other games in Pretty Good Solitaire. At that time it only had 30 games (now it has 610 [now 640]), but at that time 30 games was a lot. It occurred to me that there might be a market for a standalone FreeCell game for Windows 3.1. At that time, there were only two ways to play FreeCell on Windows 3.1. Buy Pretty Good Solitaire, or find a copy of the Microsoft Windows Entertainment Pack in stores. The Entertainment Pack had a FreeCell game that worked on Windows 3.1. But it sold only at retail and was hard to find in stores. It also had a bunch of other games that people might or might not be interested in. And that was it. If there were other Windows 3.1 FreeCell games available, they weren't obvious to someone searching the internet or online service file libraries of the time. Therefore, there was a clear market need. The Development of FreeCell Plus. Armed with Visual Basic 3.0 and the code for Pretty Good Solitaire, I created the first version of FreeCell Plus in one day between Christmas and New Year's. Since the game was already written, it was just a matter of pulling out the game of FreeCell and creating a new interface for the new game. I also added a couple of other games, Sea Towers and Stalactites, so it would actually be 3 games in one. On January 25, 1996 I released FreeCell Plus. At that time, that primarily meant uploading it to file libraries on AOL and Compuserve. I also had an AOL based web page for the game. Primary ordering was by mail order. The only online ordering was through Compuserve's SWREG service, a system where Compuserve members could buy the game and put the charge on their Compuserve bill (what a great service that was...sniff). It had a 30 day trial period, but never timed out. It sold for $12, plus $3 if you wanted a diskette. FreeCell Plus got it first sale on February 4, 1996. In fact there were two of them, both through Compuserve, one from Norway, the other from South Carolina. The first mail order came in on February 26, 1996. In fact, FreeCell Plus sold very well. It became my #2 selling product in 1996. Clearly there was indeed a market need. As the internet caught on, I added internet ordering. On March 8, 1997 I released a version 2.0 with 2 more games, that took another day or so to develop. On July 5, 1998 I released version 3.0 with 3 more games, again a day or so of work. By 1998 it was clear, though, that the days of FreeCell Plus should be numbered. Most people had moved up to Windows 95 (or 98) and Windows 3.1 was now an obsolete operating system. In September 1998 I replaced FreeCell Plus with a new game, FreeCell Wizard. FreeCell Wizard was very much like FreeCell Plus, except it added the feature of being able to create new FreeCell type games from properties set by a Wizard (this came directly out of Pretty Good Solitaire 98). And it was made for Windows 95 (32 bit code), rather than the 16 bit Windows 3.1 code of FreeCell Plus. I introduced FreeCell Wizard and planned to phase out FreeCell Plus. In 1999 or 2000, I removed the link to the FreeCell Plus page from the main page of my site. The game refused to die! But a funny thing happened: people kept on buying FreeCell Plus. Into the 2000s, Windows 3.1 is dead and buried. But apparently, there are still people out there running it. And they still want to play FreeCell. And they still kept buying FreeCell Plus. Despite the fact that the game was replaced by another game, its operating system was obsolete, it just kept going. Where FreeCell Plus stands today. The FreeCell Plus web page is still up and running. The content is essentially unchanged from 1998. However, there are no links to it from my major web pages. The only traffic the page gets is from search engines or from my freecell.org site. But it does get search engine traffic. Just go to Google, Yahoo, or MSN (take your pick) and search on "Windows 3.1 FreeCell" or "Freecell Windows 3.1". People looking for a Windows 3.1 FreeCell game still find FreeCell Plus today. And it still get sales (usually my wife says "another FreeCell Plus sale!" to me whenever she processes one). Based on some of the sales figures given at Indiegamer, it's still outselling a lot of people's games. To summarize: Over the 9 years of FreeCell Plus's life, it's sold thousands of copies and earned in the upper five figures (considerably more than $50,000). Not bad for a game that took about a week's work to create and release. For two years, 1996 and 1997, it was my #2 selling game. It then got replaced by another game which went on to be even more successful and earned in the hundreds of thousands, so it had a baby that was even more successful than itself. Its baby continues to sell quite well and FreeCell Plus itself still gets a few sales. Its customers now all come from search engines from people looking specifically for a Windows 3.1 FreeCell game. Total marketing spending was about $50. I once submitted it to various BBS systems and file libraries using an old service called Author Direct and that cost around $50. That's the only marketing I ever did for the game. The Moral of FreeCell Plus. FreeCell Plus shows how an indie game can be successful if it fills a market need. Note that the game was created because there was a market need. I did not just create a game for the heck of it and try to sell it. The market need came first. It also shows how a game will sell off of search engine traffic alone. No portals necessary. What you need is a game that is something people search for. FreeCell Plus has owned a search keyword ("freecell windows 3.1") for almost a decade. Now note that people don't search for the game specifically. That is, people don't search for "freecell plus" (well, actually, a very few people do, but obviously they've heard of it before). If you have a big hit game, people might search on the game name (I'm sure lots of people search on "bejeweled" and lots of people do search on "pretty good solitaire"). But that only happens after the game gets huge brand awareness. That only happens for the handful of hit games. Let's face it, that's just not going to happen to you. Not until after you already are successful, anyway. But a whole lot of people search for games every day on the search engines. 95% of these people have probably never been to a portal and will probably never go to one. But they do know Google, Yahoo, and MSN. And they are looking for games there. A game can be successful like FreeCell Plus if you can find a search keyword that people are looking for. And FreeCell Plus also shows that the keyword does not need to have much traffic, either. Not many people are searching for "windows 3.1 freecell" these days (and it was never very high traffic, as when there were lots of Windows 3.1 machines, there were few people on the internet). There are probably thousands of potential keywords that you could create games for. It is just a matter of targeting something that people are already looking for. It seems like a lot of indie game developers are trying to create demand for their games rather than creating games where demand already exists. You can succeed by creating demand, but probably not. It's easier and less risky to go where the demand already is. Find a keyword and own it. It's a profitable strategy. And look for ones that aren't already taken, as that really helps. FreeCell Plus had no competition for its keyword back when it counted and that helped. I'm sure the negativity people will say that it can't be done today, that it may have worked in 1995 but won't in 2005. That's nonsense. In the Long Tail there's an embarassment of niches. Find one. Find a game that fits something people are looking for. Then you'll get free traffic from the search engines. This post originally appeared on the old site on February 1, 2005. There is a newspaper article about the guy who created Snood: The Dude Behind Snood. (Note: the link to the story no longer works because the people who run newspapers are idiots). It's a fascinating article and shows precisely how shareware success is often achieved. In fact, one could take this article, change some of the details around, change the name of the game from Snood to Pretty Good Solitaire, and it would be about me. The similarities are astounding. Nearly a decade after Dave Dobson designed it, Snood -- rhymes with "rude" -- is keeping millions of people from what they really ought to be doing. Dobson designed the game with the goofy little monster faces for his wife in 1996, when he was in grad school at the University of Michigan and she was teaching high school. Change 1996 to 1994-1995, change grad school to teaching community college. That is what I was doing when I started Pretty Good Solitaire, and my wife was the very first player. On a lark, he offered it on the Internet as shareware, and figured if a few people bought it for $10 apiece, he and Christina could go out for a nice dinner. Ditto, although the internet hadn't really taken off yet when I started. Change internet to AOL and Compuserve, but the dinner was the same. No expectations of making lots of money like everybody has today, just putting out a fun game and hoping to get a few dinners out of it. Snood, once estimated to be the most-played computer game behind the games installed in new computers when they come out of the box, has made him a wealthy man. Pretty Good Solitaire was on that list of most installed games too, although a bit below Snood. He describes the evolution of Snood into a cult attraction as a series of "random events," and refers to his fame as the game's creator as "third-rate celebrity." He's got me there. I can't claim anything above fourth-rate. Again, astoundingly similar. I originally started writing games just to get experience working with Visual Basic. "And nuns," says Dobson with a perplexed laugh. "For a while we were getting lots of nuns." Wow, we got lots of nuns too. And priests, and doctors, and lawyers. Makes you wonder what they are all up to, doesn't it? Though Young teaches computer-game design and says he has students who view a shot at the $10 billion-a-year industry as their dream job, he believes it is unlikely any of them will replicate Dobson's homemade success. "His case, I think, is getting increasingly rare," Young says. "To build games these days that are really competitive. ... You really need millions of dollars in budget, a publisher that can get the games on the shelves. It's becoming like making a movie. You have to go to the big studios." All you need is a fun game. His business partner says more than 30 million copies have been installed since it was introduced, or about 10,000 per day. 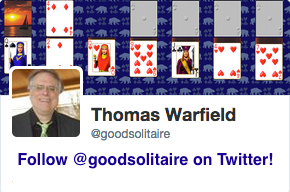 I long ago lost track of the cumulative total of Pretty Good Solitaire, but these numbers sound pretty close. As further enticement for freeloaders to pay, Dobson wrote a couple dozen four-line poems, which appear while Snoods dance in a circle at the end of each unpaid game. The poems, the gentlest form of chastisement, are metered to the rhythm of old Burma Shave signs. One poem reads: "Dave's kids need clothes, Dave's kids need food, Dave's kids need haircuts -- Please register Snood!" Wow, I did the same thing! Except not poetry. My "Meow! Please feed me!" messages in the trial version where our cats ask for payment have been extraordinarily successful. Grogin figures Snood has an indefinite life span, as long as Dobson continues to update it. Yep, the classics never die. The article has been Slashdotted, with the predictable idiot Slashdot comments. This post originally appeared on the old site on February 5, 2005. Eric Sink's latest MSDN article is out and Eric has outdone himself. This is a truly marvelous article. Read it: Tenets of Transparency (link fixed - see comments). This article should be read by all shareware developers. Eric's point is that when you are selling software, your customers have to be able to trust you. Software isn't tangible. People have to trust that it works and will continue to work. But if you want people to trust you, you have to trust them. My favorite restaurant! They don't use that slogan much anymore, but back in the day it was important. People didn't trust restaurants because they didn't know how well the food was prepared. Steak-n-Shake dealt with this by making the kitchen open to view for the customers. Too many software developers don't trust their customers. They spend a whole lot of time trying to figure out how to make their applications secure from people being able to cheat them by using them without paying. The problem is, 95% plus of people are honest. If you spend most of your time dealing with trying to stop the remaining people, you are just wasting your time. You should spend 95% or more of your time dealing with the honest customers. I generally spend only a few hours a year on working on the system that deals with the cheaters. I spend the overwhelming majority of my time on the honest majority. Eric gives 8 ways to make your software company more transparent. Good idea, obviously I'm doing it. Another good idea. It lets your customers interact with each other. My forums have not really taken off as a community, but there is still a nice amount of activity, especially in the area of players helping each other out trying win the harder games in Pretty Good Solitaire. Actually, a lot of people expect free upgrades for a $20 game, and I give free upgrades for several years. That is becoming a rarity in the indie game business these days. Most games seem to be one shots, they are put out and then never improved. This applies even to top companies such as PopCap, which apparently just puts out a game and that's it. If they improve a game, such as Bejeweled, they make it Bejeweled 2. I don't know whether Bejeweled 1 users get Bejeweled 2 for a reduced price, there's no indication of it on the PopCap site that I can find. We continually improve our games. I find that it takes several versions before a game really reaches it's potential. Very important, you have to make your license enforcement procedure as easy as possible. Over the years we have continually improved ours. Note that Eric's SourceGear stopped using product activation. In shareware, this is a given. But Eric has good advice about making your demo high-trust. Again, basic advice, but a lot of people don't do it. But if you are accepting credit cards over the internet, essentially you have a money back guarantee since it is a card not present transaction. You might as well get some marketing gain out of it. * Is the company profitable? * How much cash does it have? How much debt? * What kind of corporation is it? Who are the owners? * Do they have outside investors? * Is the founder still involved? Does she still have a decent equity stake? This is interesting. Very few companies talk about this stuff. We do make a lot of this stuff known. Yes, we are profitable. I like the company to have a lot of cash available in case something goes wrong. If something did happen, I could cut expenses down to a minimum and the company could run for several years with no revenue. This is a tremendous competitive advantage. If a big economic downturn were to happen, we'd be in a position to ride it out for a long time. The company has absolutely no debt. My wife and I are the only owners, no outside investors. Obviously, the founder is still involved. Just remember to always under-promise and over-deliver. This post originally appeared on the old site on December 14, 2004. In the course of events I recently came across this site: Solitaire Strategy Guide. This is an interesting page about strategy for solitaire, specifically for the game Klondike, which is referred to on the page as "solitaire", as if it is the only solitaire game (this is common). Klondike is, of course, the solitaire game that is bundled with Windows. The 9 rules are interesting and are listed by order of importance (meaning the first rules always take precedence over the lower rules). I agree with most of these rules, although the terminology is a little weird. 3. When faced with a choice, always make the play or transfer that frees (or allows a play that frees) the downcard from the biggest pile of downcards. In general this is true, but I wonder if it is always the case. What if the first downcard in the smaller pile of downcards allows you to make more plays to uncover more downcards than the other card? It can happen. Of course, the only way to really know is to use undo and try both alternatives. This brings up the question of whether in strategy rules you can be allowed to check each alternative - strictly speaking, that's probably not allowed for a strategy but in practice it is what everyone does (at least, if you are playing with a game like Pretty Good Solitaire that has multiple undo). In rule 7, what he refers to as "next card protection" is actually what is known as "safe autoplay", which has been in Pretty Good Solitaire since forever. Safe Autoplay means that you don't move up cards to the foundations if that card may still be needed in the tableau as a spot to park a lower ranked card on. It's the situation when, for example, you could play the 4 of Hearts to the foundations but the 3 of Clubs hasn't come out yet and there's no place to put it if it did. In that case, you want to leave the 4 of Hearts in the tableau so you can play the 3 of Clubs on it when it comes out. When AutoPlay is turned on, Pretty Good Solitaire will not automatically play the 4 of Hearts up to the foundations in this situation, which confuses some people who don't realize the importance of this. I get an email or two every week about this from people who think that the AutoPlay in Pretty Good Solitaire has a bug in it because it isn't playing everything up. The most interesting thing about these rules is what he called "smooth". It took me awhile to understand what he meant by this (you have to read the part on the left side and continuing below the rules). I think a better term for this would be "flushing the pile" (borrowing the word flush in its poker sense). A pile would be flushed if the cards of the same color are also all of the same suit. If you think about it, it is clearly desirable that the cards in an alternate color pile be flushed as much as possible. It will make it much easier for the pile to move up to the foundations if this is the case. What I don't understand is why he limits rule 8 to cards of rank 5,6,7, or 8. It's clear why you wouldn't want these restrictions on 2s or 3s, but why not include 4 and why stop at 8? I'm not clear on the reasoning behind why this rule is the way it is. I've tried playing these rules on the game Gold Rush, my favorite Klondike type game, and they seem to work well. Although with Gold Rush, you have to make some modification for the fact that there are only 3 redeals. On the 3rd redeal, you will never see a card in the waste again so you had better play it if you can, rule 8 notwithstanding. This post originally appeared on the old site on October 13, 2004. It's still true today, except the bubble has gotten bigger. Dan MacDonald has written his impressions of the IndieGamesCon last weekend. Mostly it was about how the people from the major gaming portals acted. Last year, before the bubble really started to take off, the portal people were apparently helpful and interesting. First a little background, last year there were a number of producers from the various channels, Shockwave, Real, etc. They were really nice guys, they were more then happy to take a look at your game give you advice on how to improve it so that it would sell better to their audiences etc. They seemed like normal human beings. This year, the mass market / casual games space is big business. PlayFirst was there, having just come off a first round of funding totaling 4 million. Of course PopCap was there with their millions, the dude from popcap was wearing clothes that had to have cost more then my car. (my ´89 firebird cost about $1700 and this guy was close). Basically there is this major shift in how things work for the mass market space. Distribution channels like Real, Shockwave, yahoo games, MSN etc. are tired of the overhead of dealing with hundreds of indie developers to get games. Not only that they are giving away less and less in terms of royalties, where it was once 40-50% for developers it´s now down around 20% and will continue to drop as the players get bigger and the developers loose leverage. So now there are new portals and they are looking and acting more and more like retail publishers. The general feeling I was getting from members of the panel was "hey guys, we are the gatekeepers now, time to bend over and take it." Gate keepers to what you might ask? well the mass market as they would describe it. Games like Zuma, feeding frenzy, or bejeweled that appeal to the majority of "casual gamers" out there. This article has generated a lot of discussion on the IndieGamer.com discussion board. Primarily, there is a fear that the portals will become just like retail publishers. Royalty rates will continue to drop and eventually independent game companies will become totally dependent on the portals to survive (see Why Pyrogon Failed for how this can happen). However, as long as game developers do not put themselves into a position of dependence on the portals, this simply cannot happen. The reason it cannot happen is that there is a fundamental difference between retail publishers and the online portals. Retail publishers (and their distributors) control access to the space in retail stores. This space is limited in supply and it is also very expensive to fill. It takes a lot of resources to get software product into retail stores. A small number of companies can control this space because of the high barriers of entry. Now, it is certainly possible for new companies to come along and get their product into stores (in fact it happens often), but it is difficult. It takes a lot of work and a lot of financial resources. Online portals, on the other hand, only control space on their own web sites. This space is not limited and it is not expensive to create your own web site and compete with them. All they really have, when you come right down to it, is internet traffic. They have customers coming to their site. But internet traffic is extremely fickle. Think of the sites that were big with internet traffic in 1999. How many of those are around today? Not many. Internet traffic comes and goes quickly. People only come to your site and come back if there is something interesting there. The portals only have traffic and customers as long as people are finding interesting games there. Once a person buys a game from a portal and it turns out not to be as good as they were expecting, that traffic is gone. In the end it will come down to the portals having to have good products with good customer service in order to keep the customers coming back. What is going to happen to these portals is the same thing that happened in the internet bubble in 1999-2000. Things are going to look great and the market will look like it will expand forever, and then suddenly it won't. The weak companies will get hit first and a lot of the portals will fail. The market for these games will crash and when it is finally over only those who have the best games and the best business strategy will survive. Those developers who are dependent on the portals alone for their income will find themselves in a world of hurt. I have nothing against the portals and wish them luck, but I'm not going to get dependent on them. I have one game (Pretty Good Solitaire) on one portal (Real), so I get a small amount of money from them. But I still make far more from my own site (in fact I also make far more from retail publishers), so that portals are only a tiny fraction of my income. I'd put my games up on other portals if a deal came along (as the car dealerships say, no reasonable offer will be refused), but again I'm not going to get dependent on portal income. In the end, the best sales are always the sales from your own web site. Developers should be spending most of their time trying to increase traffic and sales to their own sites. Bringing traffic to your own site is still not that difficult or that expensive and a good game with a well designed site will bring in visitors and make money. This post originally appeared on the old site on September 16, 2004. I'll look at these based on my experience. Absolutely true. Eric made his first application small enough so that he could complete it in a month. That is also about how long it took me to complete the first version of Pretty Good Solitaire. People think you have to have the best application on the market from day 1. No, you just need something that is good at whatever it does. You can make it better over time. The important thing is to get it out there so that you can start getting feedback on it to find out how you need to make it better. The first version of Pretty Good Solitaire contained only 5 games. It was not the best or biggest solitaire game available at the time, although it did have several features not found in other games that helped define it as different from everything else. That was more important than having everything in a first release. Also true. Steve Pavlina is big on saying that you should "burn your ships", quit your job and give it everything you have. I think this is a very risky approach and sets you up for failure if things don't go well right away. Keeping your day job and working part time is a much safer method. It might take longer, but success does not necessarily go to the swiftest, just the most determined. I kept my day job for nearly 3 years after I started. That may have been too long, but I was never in any danger of failure because of it. I agree with this as well, although a lot of people don't. There may be a difference here between business and consumer products, but I believe that with a consumer product you are actually better off if you appear like a smaller company. People feel that the company is more personal. I've never pretended that our company is anything other than a two person company and I think it has worked to our benefit. Yes, this is important. You need to have some attribute that you can own in the market. For Pretty Good Solitaire, while partly it has been "most games", it really is in the name itself. It owns "pretty good", the feeling of quality of the game itself, which emcompasses the many games but also the sense that it is the game for people who want to play solitaire seriously. This one I am in less agreement with. If you are just starting out, it is probably true. I didn't spend much on advertising the first few years. But now I spend quite a bit on it (in fact, it is by far my largest expense). But the key qualification is "don't spend much on advertising that you cannot directly track back to sales". With Google Adwords and Overture, you can directly tell how much your advertising is bringing back in sales. Used properly they can be quite profitable. I agree with Eric's sentiment but not with his implementation. You don't want to hassle your users (especially your paid users), but you absolutely need to know who your users are. Conventional wisdom says I should grab customer contact information so that I can specifically target my customers with new products and upgrades and newsletters and books and T-shirts and socks. Yes, conventional wisdom is right, selling to your previous customers is absolutely the best form of marketing. But there is an even more fundamental problem with not collecting contact information. Without a database of users, you don't know who your users are. When someone loses their code (or their copy of the application, if you don't use codes), you have no way of verifying who they are when they contact you. This is probably the single most common form of customer contact, and without a customer database you simply can't help them. So you will be unable to do the most important customer service task that a small shareware software company does. This won't earn goodwill, it will just get your customers mad when they contact you and you can't help them. This post originally appeared on the old site on September 14, 2004. Eric Sink has written an article for MSDN called Exploring Micro-ISVs. In it, he discusses small, one person (or perhaps one programmer) companies, which he calls "Micro ISVs". There is a lot of interesting stuff in this article and it is going to take me several posts to comment on it all. First, I'm not a big fan of the abbreviation ISV. It stands for "Independent Software Vendor", and it's just like Microsoft to refer to what are basically their customers as a 3 letter acronym. Still, there isn't a really widespread term for a small software company. One word that I like is nanocorp, which means a small one or two person company. What interests me about this subject is that my entire business model is to be (and always be) precisely a small software nanocorp or micro-ISV. When I started Goodsol Development it was with the expectation that it would always be a one or two person company. It was never intended or expected that it would grow to become a larger company than that. There are several reasons for this. I didn't want to have to go into an office every day, I wanted to work at home for myself. I also never want to hire someone, as that would require an office and having to actually oversee them and deal with all the issues that brings. My decision was to stay small and outsource all activity that I couldn't do myself. This means that there are a lot of things you can't do, but it is remarkable how much you can do. Also, if you pay attention to automating and outsourcing, you can really grow. I would also have said that nobody makes a living doing shareware full-time. The ASP has been working to try and change this, and in fact has just released a membership survey about this very topic. The results show that the ASP membership is basically divided into two disparate groups. First, there are the stereotypical shareware hobbyists who make less than $25,000 a year from shareware. This group makes up about two-thirds of the membership surveyed. And then there are the success stories that make more than $100,000 a year. They make up a little more than 15% of the membership. I suspect these numbers are skewed a bit - I suspect there are more successful shareware companies that this survey would indicate. The more successful companies were probably more likely not to respond to the survey. In any case, clearly it is quite possible to be quite successful at shareware. And it's not just recently with the internet that shareware has been lucrative. Bob Wallace was very successful in the early 80s with the first shareware application, PCWrite. Marshall Magee was successful in the 80s with Automenu. He is still selling it today at http://www.magee.com/ even though it is a DOS program. More recently Eric Isaacson has made a nice living selling a DOS zip code lookup program. He's still working on a Windows version (in Assembler, that's the only way he programs) and everybody else has enjoyed kidding him about the Windows version for about the last decade. However, the failure rate at shareware is very high. But then that is true with all small businesses. This post was originally posted on the old site on May 5, 2004. I've had a request for more information about good books on stock market investing. I've been meaning to post about stuff like this for some time, so now is as good a time as any. First, let me state that investing well is not easy. It is something that takes a lot of time to learn. You can't expect to read a couple of books and become a stock market expert. You need to study it and most importantly, do it for a period of years in order to learn it. You will probably lose money for awhile as you learn. I started investing in the stock market in late 1999. In retrospect, it was both the worst possible time to start and the best possible time. It was the worst possible time because I jumped in right and bought all the usual suspects, Microsoft, Intel, Cisco, Applied Materials, and so on. And they went up and I thought it was easy. And then they started going down. And down. And down. And down. And because I was a total idiot, I bought more, thinking they were cheap. And they went down more. I wound up losing nearly 30% of my money before I started looking at what was going on and sold those bowsers. Now, I wouldn't touch those companies with a ten foot pole. I started reading books about investing, discovering that many were bad but there were a lot of good ones. It become the best possible time because it forced me to learn about the subject and to really study it. I looked at the kinds of companies that were big, steady winners in the past and noticed that most of them had some things in common. Most of them paid dividends, and much more important than how big of a dividend they paid was that the dividend was increased every year. Also, smaller companies grow faster than large companies. So I started looking at small companies that increase their dividends every year. I also looked at strong profit margins and high return on shareholder equity. With this change in focus, my portfolio bottomed out in April 2001 and I started buying some of these types of companies. Instead of tech companies or famous blue chips, I bought companies like Sysco, Countrywide Financial, D.R. Horton, McCormick, New York Community Bancorp, Commerce Bancorp, Stryker, Factset Research, and a few high growth companies that don't pay dividends but are fine companies like Apollo Group and Chico's FAS. My search for small companies with great dividend growth turned up some real little unknown gems like American Vanguard and Raven Industries in incredibly boring industries. I bought stocks that were going up and making new highs. I subscribed to Value Line and Investor's Business Daily. Of course, I also made a lot of mistakes and bought some stocks that didn't go up, but I now cut my losses at no more than 8-10% and I never, ever average down (that is buying a stock that you already own at a lower price than what you previously bought it in the hope that you are getting it cheap and it will go back up). Over time, I have gone from a buy and hold investor who only looked at fundamentals to a technical analyis trader who only looks at a very few fundamentals (primarily dividend growth rate, profit margin, and return on equity) and looks primarily to technical indicators like moving averages, MACD, stochastics, parabolic SAR, and other highly technical indicators to time my buys - and more importantly, my sells. What they don't tell you on CNBC is that how you sell is far more important than what you buy. The art of cutting your losses quickly, letting your winners win, and knowing when to sell a winner is far more important to making a profit than which stocks you buy. I suspect you could select stocks at random and, if you have good selling techniques, make money. And in virtually any market (except perhaps one that is crashing down). But even then, you'd know enough to get out while the damage was as small as possible. I'm still working on my sell rules. I got caught a little flat footed in April when all my financial stocks decided in unison to make a beeline to the diving board off the deep end. I sold a number of them a couple of days later than I should have and it cost some of the gains. But I learned some new things to look out for. It is also very important how much you invest in each particular stock. When a stock has a high probability of being good, you take a larger position. You can also buy, then if it goes up, buy more. In this way you build into your winners (it's called pyramiding). If you aren't sure about a stock but want to get in to test the waters, just buy a very small amount. This kind of allocation will make your winners be large positions and your losers be small ones. Reminiscences of a Stock Operator by Edwin Lefèvre. This is absolutely a classic. It is really by Jesse Livermore, who was the boy wonder of Wall Street in the early 1900s. How I Made 2,000,000 in the Stock Market by Nicolas Darvas. Despite the goony title, this one is a classic, written in the 1950s when 2 million was real money. How To Make Money In Stocks: A Winning System in Good Times or Bad, 3rd Edition. This book covers O'Neil's CANSLIM system. I've had success with this system, especially when used with dividend growth stocks (O'Neil doesn't think much of dividends). The Dividend Growth Investment Strategy: How to Keep Your Retirement Income Doubling Every Five Years by Roxann Klugman. A decent book on dividend growth stocks, although it focuses too much on large companies. The Dividend Rich Investor: Building Wealth with High-Quality, Dividend-Paying Stocks by Joseph Tigue. High Probability trading by Marcel Link. This is an excellent book about what you really need to know for trading. Technical Analysis of the Financial Markets: A Comprehensive Guide to Trading Methods and Applications by John J. Murphy. A good starting place for technical analysis. The Secret Code of the Superior Investor: How to Be a Long-Term Winner in a Short-Term World by James Glassman. Trade Your Way to Financial Freedom by Van K. Tharp. For some more book recommendations, see The Big Picture's Worthwhile Reads. Right now I am not very optimistic about the near term future of the stock market. Stocks go through a very definite 4 year cycle that coincides with the presidental election cycle, and with the election coming up we are coming up on the time of the 4 year cycle when stocks peak (4 years ago by this time we were already past the peak). Historically, it is highly likely that stocks will go down either starting now or after the election. Plus, coming out of the bubble we are in a situation similar to the 1930s. If you look at the NASDAQ since 1999, it looks just like the Dow after 1929. If you look back at 1933, it was a great year just like 2003. But 1934 had a nasty little correction. It looks like a little blip on the chart now, but it was a pretty big drop in its own right. It seems likely that something similar will happen in 2004. The good news is that 1935 and 1936 were great years for stocks, so if the historical parallel holds there could be a great buying opportunity ahead. I suspect things are going to look pretty bad before we get there, though. Update: I now have a stock market blog at Solitaire Trader. This post was originally posted on the old site on April 23, 2004. It was one of the most linked and highest traffic posts on the old site. Brian Hook, founder of the independent game company Pyrogon, has posted A Pyrogon Postmortem, an article of the reasons he believed his company failed. Read the article, it is a very interesting read. Based on the experiences of my nearly 10 years in the independent, downloadable games business, and a look at the companies web site and a careful reading of his postmortem, I come to completely different conclusions for why Pyrogon failed. 1. Pyrogon put the success or failure of the business into the hands of people other than themselves. 2. They paid no attention to marketing. 3. They pursued fads rather than focus. 4. They had no long term plan. These reasons are often inter-related, let us start with the first and most important. We also benefited tremendously by seeking out larger portals such as GameHouse, Real Networks, and PopCap to distribute our games, even though our take would be much smaller. Their audiences are so vast that the lower profit is more than compensated for by the volume. Wrong. Wrong. Wrong. Completely wrong. They didn't benefit from this, they were killed by it. The large game portals give the illusion of giving a large volume of sales, except they don't actually. The typical game sold in the large portals sells next to nothing. And the portals take the vast majority of the proceeds of this next to nothing. The large portals sell so many games that any individual game gets lost in the shuffle. A game only sells if they promote it, put it on their top page or in their newsletter for a week. Then when it is removed for some other game the game goes back to obscurity. Unless you have a Bejeweled-like hit, there is no way you are going to make as much money from the portals as you could selling it on your own. The portals don't care about your game the way you care about your game. Real Networks/GameHouse is interested in making money for Real Networks/GameHouse. PopCap wants to make money for PopCap. Your game is just another listing. If it doesn't sell as well as something else, it will never get promoted. And unless you are Bejeweled, your game won't sell as well as Bejeweled. You won't be promoted, you won't make much. And it gets worse. The most important part of an independent game business is acquiring customers. Getting them for your first game, then selling them your second game. When you sell your game to a customer of a portal, you get only that small part of the sale that the portal generously hands over. You don't get the customer, you don't know who the customer is. You can't sell that customer your second game because you can't contact them and they can't contact you. In short, you can't build a business. There is no way I would do a deal today to sell my games in a portal without getting the names, addresses, and email addresses of the customer. Absolutely no way. It does not matter how many copies they think they can sell, or what percentage they give. It is not worth it, it is not a business. By putting their entire destiny in the hands of the portals, Pyrogon put the success or failure of their business into the hands of people who simply did not care whether their business succeeded or not. The entire burden of selling their product was put into other people's hands. Which brings us to point 2. Every month I had to sit down and pay bills; we had to find insurance; we had to find an office; we had to monitor the Web site for outages; we had to package up installers and upload them; we had to do marketing by hitting all the shareware sites; etc. etc. None of these issues in isolation were that big a deal, but all these little (but important) things were constantly assailing me while I was busy trying to get "real" work done. This paragraph is the only occurence of the word "marketing" in the entire postmortem. Yep, I checked. They had to do marketing instead of getting real work done. What a bother! This attitude, coupled with the abdication of the business in point 1, pretty much says it all. I would say it guarantees failure. It does not appear that Pyrogon did any marketing on their own. Their web site is not designed for marketing. There isn't even any place on their main page to sign up for an email newsletter, one of the very basics of internet marketing. Basic things like order links on the main page don't exist. According to the Alexa, the site's Alexa rank is over one million, which means it gets very little traffic. A quick Google search on MahJongg solitaire to find search results for NingPo MahJongg turned up nothing in the first 5 pages of results. Simple redesigns to the site and some basic internet marketing could probably increase the sales from their web site many times over. But they turned over the burden of selling their products to someone else, so they didn't focus on it. Pyrogon started out making one kind of game, then looked where the wind was blowing and made a different kind of game. This game was successful. Then they turned out other games, but the games don't seem to have anything in common. Did they do a survey of the customers of their first game, asking them what kind of games they would like to determine what to do next? It doesn't appear so, and because they sell mostly through portals they probably couldn't contact their customers to ask them anyway. Did they try to link the games, so that someone who liked one would immediately see that the other one was by the same company and that they would probably like it? It doesn't appear so. There doesn't seem to be much link between the games at all, nor any strategy to attract the customers for one of their games to another. It looks like they developed their products on a pinball basis - where ever the ball bounced to, they developed a game. They even bounced around within their individual products, developing Windows versions, Mac versions, Linux, and so on for each game. Now it takes a lot of time and effort, regardless of how well you do cross platform development, to put out versions for different operation systems. This was a two person company, after all. Diluting the focus by covering all platforms meant they were spending an awful lot of time on developing for OSes with marginal markets instead of devoting their time to selling their existing products. By switching their focus and bouncing around so much, they had no long term plan. They had no plan, it appears, to build a business over a 5 or 10 year period. The postmortem gives no indication that they thought about how to build from one product to another, not just on a development (code) basis, but on a marketing basis. How does this next product fit into the existing lineup, how does it fill in something that our customers would want, and so forth. But if you don't know your customers, it is hard to figure out what they want. Which takes us back to the fundamental flaw of point 1. The portals are a recent development and still a fad. It is not certain that they are around to stay. They may decide that they want to focus on some other kind of games than the games they currently do. They might decide at any time to change and drop your game. Putting your entire business into their hands is just playing the lottery, not a long term plan. A game development company around for the long term will develop products that have a common theme, and they will build a customer list and market to their customers. They will try to find out what their customers like and make more of it. A long term business won't depend on whatever the current bestselling game type is, but will find a niche where it can prosper. It's not easy to do, but quite a few companies (including mine) have managed to do it. The key is to realize that you are in business to provide for your customers and to make the kind of games they enjoy (and it really helps if you enjoy those same kind of games). You have to try to get every customer you can and to sell them as many of your games as you can. Selling to the portals is fine as long as you consider it as a bonus and don't base your business on it. In the long term, you have to base the success of your business on yourself (or yourselves if it is multiple people), and make it so that the success or failure of the business will be up to you, not others. With the new year I will be reposting old posts from the old Blogger site again. This post was originally posted on the old site on April 27, 2004. Based on some of the discussion on the IndieGamer Software Forums, I'd like to clarify my position on portals. Portals are gaming sites such as Real Networks, Yahoo Games, MSN Zone, GameHouse, or Big Fish Games. They essentially act as online publishers. The reason you would want to be on a portal is that they have a lot of traffic. However, they take a huge part of the sale (almost always over 50%), and the amount of the sale that they demand has been increasing over the years. Essentially, these portals are nearly exactly like retail publishers, and in fact I suspect that they would like to become the equivalent of retail publishers for the online world and would like to have the same market position that retail publishers have. That is, you can't really sell a game retail without a publisher. The portals would like to make it so that you can't sell a game on the internet except through a portal. Then they would command the same market position and be able to command the same rates (ie. they would give only a 5-15% royalty on a sale in most cases). They are certainly trying to head in that direction. I have nothing against portals. However, I believe that if you want to be successful as an independent game developer that you need to control your own destiny - else you aren't really independent. If all or most of your sales are coming through a portal, then your situation is really no different from being dependent on a retail publisher. The publisher/portal has control over nearly all the sales of your game. Many of the people coming into independent game development right now are fleeing the retail game development industry - where the large publishers control everything. The large publishers are squeezing out all the smaller and independent companies and they are coming to the downloadable independent games area in hopes of avoiding that kind of control. But if you then attach your destiny entirely to a portal, you are just exchanging one kind of publisher for another. And in the end, the portals will try to do the same as the retail publishers if they can. That said, an independent developer can do business with the portals and remain independent as long as they don't base their business on relying on the portals for all or a large part of their income. If you think of portal income as just bonus income on top of your regular direct sales, that's great. I consider my retail sales the same way, it is just extra bonus sales. I don't let my business get dependent on it, but it is great if it is there. I do work with one portal which I've been with since they started. It basically been a downhill situation for a number of reasons, including high personnel turnover (I don't even know who my producer is anymore and have no means of contacting anyone there). Another problem is that they are just flat stupid about pricing. They have lowered the price twice and each time sales dropped. And because they price so low, there is no way I'd ever allow them to have a current version, because I can't trust them to price it properly. It brings in a small amount of money, but also some problems, because occasionally we get contacted by someone who has purchased from them. We have to tell them that they have to contact the portal for support, because we have no idea who they are, since we get no customer information from them. It makes for a bad situation. If there were a portal that priced products properly and gave us customer information about the sale, then I would jump at the chance of working with them. But as it is, the portals simply aren't worth the problems.